One thing you can guarantee when putting on any Asia album is the great harmony vocals of John Wetton and Geoffrey Downes alongside some great guitar work and the solid drumming of Carl Palmer. 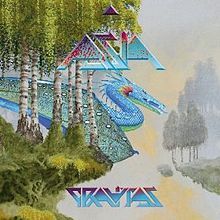 The band’s latest effort Gravitas is no exception. It is also the first Wetton album since Astra not to feature original guitarist Steve Howe who left to focus his time with Yes and his other projects. Howe is replaced by newcomer Sam Coulson on Gravitas who came aboard on the recommendation of Paul Gilbert. “Valkyrie,” the leadoff track, was initially intended to be used as the title of the album as well. “Valkyrie” gets off to kind of a slow start before it begins to remind one of the band’s more recent albums. To me the song lacks a strong chorus which causes it to lose some of its luster despite a decent guitar solo by Coulson. “Gravitas” on the other hand starts off innocently enough with a two minute intro before the main part of the song kicks into gear. Definitely reminds one of old school Asia once it does. Some of the highlights include the piano heavy “The Closer I Get” albeit a slower song it remains one of the albums standout tracks. One listen to “Heaven Help Me” and there is no denying what band recorded the song as the group vocals of Wetton-Downes stick out in grandiose fashion. “I Would Die For You” and “Russian Dolls” are two more solid tracks that will grab your attention upon first listen. The true gem of the album is “Joe DiMaggio’s Glove,” a song that recalls summer love and how it makes one feel inside. Gravitas is one of the more enjoyable Asia releases this reviewer has experienced. Although it won’t be mentioned in the same breath as the debut or Alpha for that matter, it does stand up quite well against the rest of the Wetton-era catalog.